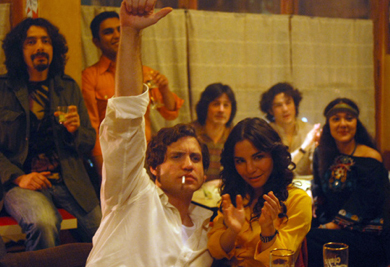 As I sat watching the five-and-a-half-hour long Carlos, the biopic about lesser-known 70s pro-Palestinian-Che loving international terrorist Ilich Ramirez Sanchez, aka “The Jackal” and Carlos, I wondered why it seems that films about revolutionaries and terrorists are always so long. The fact that I was thinking about that during the viewing may reveal something of my “powers” of observation, but probably more about my level of attraction to the film, or lack thereof. Sanchez/Carlos was a notorious terrorist for 20 years, starting his career in London, until he was arrested in 1994 in Khartoum. He lived in various countries, under numerous pseudonyms and spoke several languages while working for established terrorist groups as well as forming his own organization. (He represents an old school brand of terrorism that fell with the Berlin wall.) The origins of his politics and terrorism rational were deeply rooted in his regard for the Marxist doctrine and sympathies for third-world nations. Such loyalties led to the infamous hostage takeover of the OPEC oil ministers in Vienna in 1975. For all that, many questions still linger about him, his history and his techniques and motives. To a certain degree these and other questions get examined, if not answered, in the drama directed and co-produced by Olivier Assayas. Initially slated to get a brief theatrical release through IFC, the main venue for viewing the unfolding of Sanchez/Carlos’ escapades will be on TV as a three-part drama. Normally, I would advocate for big screen access, especially if that is what it was shot for and intended by the director. But in this case I believe television broadcast in multiple segments will probably prove to be the better format for the film, as something gets lost in the translation of five-point-five hours on the big screen. This is not to say that overall it is not a good drama. The premise is interesting, the performances, from the lead Edgar Ramirez, to every supporting and minor role are impeccable. What falls short is the combination of execution and length. A true character study would get in close, explore personal histories and motives. Instead Carlos is a bit broad and impersonal. Terrorists by nature are one-dimensional people, narrow-minded, focused and rigid. While that usually stirs up controversy, curiosity and hatred, it does not necessarily make for good character study … at least not for five hours. (For that, more of a narrative line is needed, like Steven Spielberg found in his 2005 terrorist revenge film, Munich (also a long movie). In it, the antagonists were grappling with their conscience, giving the characters and story complexity.) In Carlos, there is no such complexity. How many scenes of grenade wielding terrorists, bombs going off, inner-circle arguments, sexual prowess can one watch without it becoming a bit tedious and repetitious? In my case, about two-and-half-hours worth. For you, maybe more, especially in the comfort of your home in digestible portions.